What has happened to us? What’s with this shawl thing? Have we given up on decreases? Remember blocking? As we all know, Koigu is famous for its multicolor Painter’s Palette Pure Merino. Justifiably covetable for its miraculous mixes of colors. But I’m here today to testify about the gentle pleasures of KPPPM’s sister KPM. KPM has to sit around and listen to everybody blab on about how colorful and fabulous KPPPM is. But KPM, darlin’, listen–you are a beautiful yarn yourself. You think you’re plain old indigo; you’re medium indigo and dark indigo and rilly pale indigo where the dye didn’t take. You’re no cheerleader; you’re editing the literary magazine, girl. What my picture cannot capture is the endless shifts of color in these skeins that purport to be solid colors. 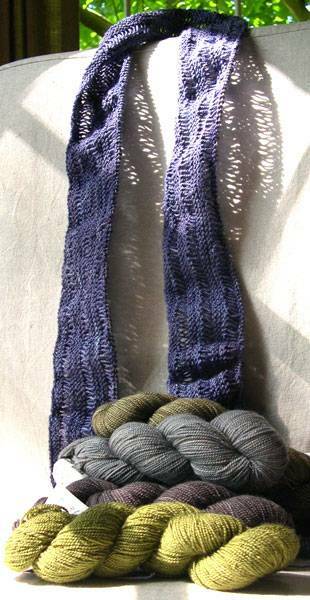 They are NOT solids at all–the hand-dyeing leaves all manner of subtle variations. Now, I’m the first to tell you that Alligator Wrap is not much of a pattern. “Cast on. Knit forever and drop those wrappy stitches. Cast off. Put fringe on if you feel like it.” Can you believe I paid money for this pattern? But KPM is carrying the day here as I chug through 100 inches of shawl. ETA: June 12, 2008. I think we’re headed for a Midsummer’s Night Steek before too long. Keava is quietly making her way into the world. Here she is, big enough for a seat cover at this point. (I have not abandoned my idea of knitted upholstery, you know.) Every time I return to Keava I’m surprised at the colors. Nutty combination, and a clink of the glass to Ms. Alice Starmore for her spectacular color sense. Keava is beautiful, and so mysterious…. Perhaps she’s not quite ready for her debut, so hiding in the shadows until she’s *sure* it’s time? Meltingly gorgeous Koigu – far from plain. Such riches and jolly nice photos too. I’m also enjoying the Afghanalong side show.The diversity of what is produced when knitters are asked to knit a square.Astounding ! Love the Koigu. Did you see my new made-with-scrap-Koigu shawl when you went to the new store yesterday? It was a lot of fun to knit and I was able to ignore pressing business, like school and grades and Andrew’s upcoming college trips. I will soon have an empty nest. Well, except for the stash. Ann – I love the alligator wrap in “solids” – I learned about drop stitches from the pages of my 1970s edition of Readers’ Digest Guide to Needlework – but I really love this project from the Keyboard Biologist: http://www.keyboardbiologist.net/knitblog/archives/000183.html – scroll down and see the beautiful pictures of the crossed drop stitches. Besides the koigu project, I’ve got 10 balls of linen drape that need to go into a wrap – something openwork, nettish. I want to try something with that icelandic spun laceweight too – I’m looking for lace patterns that are a little odd – more macrame – any book suggestions? Go Keava! I knit so many hours in a row on Suzani over the weekend (long flight + flight delays) that my hands were literally cramping, so she’s taking a little vacation for now and snoozing in her bag while I divert myself on size 8’s and 9’s. If only I had more than 2-1/2 repeats to show for all that effort! 5 more repeats and then I’ll be done…with the first half of the wrap. And I still love it. How weird is that? When you’re done with Keava would you please start another Starmore so Suzi and I can still enjoy your company? I share your love of KPM and other yarns masquerading as solids (such as Manos). And Keava’s looking gorgeous! Brilliant work on Keava. I need to get back to Roscalie PDQ before I forget how to do it. A week away killed my momentum. I’m with you on the solid Koigu too. I have some “plain” yellow with the most beautiful shadings of cornmeal and butter and egg yolk — I don’t know whether to knit socks or bake a cake with it. If I ever manage to locate Koigu in a store, though, there’s nothing but the flashy multis that don’t do it for me. Sigh, that was me above, once again forgetting to type in my name. Oh my, the bib is very…..macrame. Those long beaded fringes make me think of the things in E Knight’s Simple Crochet – perhaps my linen is destined for a crochet, macrame table runner that doubles as a shawl? Someday, I’ll have to get my hands on some Koigu – but from the sounds of it, that could end up being totally disastrous as far as the bank balance/overdraft is concerned! Colinette is bad enough… their almost solids are utterly gorgeous too, esp. the purple-y shades. I do love the linen swatch – it’s so crisp but flowing. Personally I like the scallops, but then, I don’t have that thing about crisp square edges – if it’s got to be flat then moss stitch (& a gazillion pins) is going to be a lovely way to go. – It reminds me that once this babe has decided that he does want to arrive (4 days over D-day & counting…) that we’ll have to go on a little outing to the north of the county & visit the House of Hemp & drool horribly over their lusciously coloured hemp yarns. (the same studio also does some utterly delicious hand-dyed silk velvet clothes, scarves etc too – maternity pay’s not that great – I’d best leave the credit card at home!) When I go, I promise to take the camera & provide you with a small report. Keava’s growing well – looking utterly yummy too. Shaded Diamonds is approving of my need to rest & antenatal maternity leave – I’m over halfway up the back & should hit the armholes sometime today. Keeva is so lovely & it’s growing so quickly!! I have only just bought some Koigu and it’s sooo nice, definately dibble-ishous a la Homer Simpson! I haven’t seen the solid colours yet but love Manos so have a feeling I’d love the KPM too. Mind you there isn’t much I don’t like! Look forward to seeing the Aligator grow! Theresa–I know, I know! Sometimes it really is a luxury to have somebody else do the math, even if the math is something my cat could figure out. I’m still working to liberate myself from patterns, but then again, a pattern can be verrrry helpful. I bought that Koigu in a fever, and really should NOT have been buying any yarn at all. But when the lady handed me this enormous binder of shawl patterns, well, finding a pattern kind of nudged me over the edge. Enabler. Jo–Four days late? Clearly, this is going to be a relaxed, nonobsessive baby. Best of luck! And House of Hemp sounds like a required stop on our World Tour of Yarns. Field report, please. I’m wondering if I am getting to the point that I like every single yarn I see. At this stage I can still walk by a bin of eyelash/ladder/shiny/flurfy yarn without a blink, but I had a handpaint moment the other day that surprised me. Handpaint? I used to be strictly a DK wool kind of gal. Evelyn–It’s like bicycling on the beach, this Starmore stuff. It can be done, but you’re going to be bummed if you’re in a hurry. Every time I get in the mood to crank on Keava, I end up doing a row or maybe two. There is no cranking allowed, for me. I have no speed at all. But I still love to do this kind of knitting–love the yarn, the pattern, and figuring out how the color works together. I don’t really understand how it can be so compelling, but it is. Send Suzani pix when you feel like it! Alligator wrap sounds great Ann – a pattern where you’re suppposed to drop stitches ??! Lovely colours but Kay’s right you know, hide it from Buffy or you’ll lose it ! Anyway, I know what the 11th commandment is now – “Thou shalt not covet thy neighbour’s Keava” ….. but what the heck I’m going right on coveting.